According to analysts, in the three months to December, the headline Consumer Price Index (CPI) dropped by 0.9 percentage points relative to the previous quarter to reach bottom at 0.0%, most likely in the face of sliding oil prices. 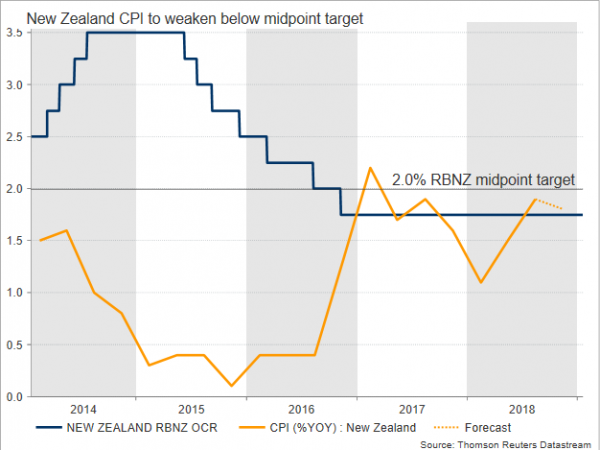 The annual measure, which the RBNZ uses to set monetary policy, is also expected to ease, from 1.9% to 1.8%, giving less incentive to policymakers to hike rates, as anything above 2.0% would be more acceptable within the 1-3.0% range the Bank aims to stabilize price growth. Besides, with core measures staying muted, speculation is rising that wages are not increasing enough to boost consumption and hence inflation. The unemployment rate fell to decade lows in the third quarter, but wages are said to have grown modestly during 2018, making the elevated property and rental costs still not so affordable. Last week’s December electronic card retail sales also highlighted the pressure on consumers, arriving surprisingly at the lowest in ten years despite the festive Christmas season. While someone would expect the saving from lower oil prices spreading to other industries, this did not appear in the numbers, with business confidence also stuck in negative territory in the same month. Yet, should the labor market tighten further making the skill hunting more difficult, employers could soon be forced to start raising pay soon. External risks are also heating in the horizon, clouding the outlook of the trade-heavy economy. 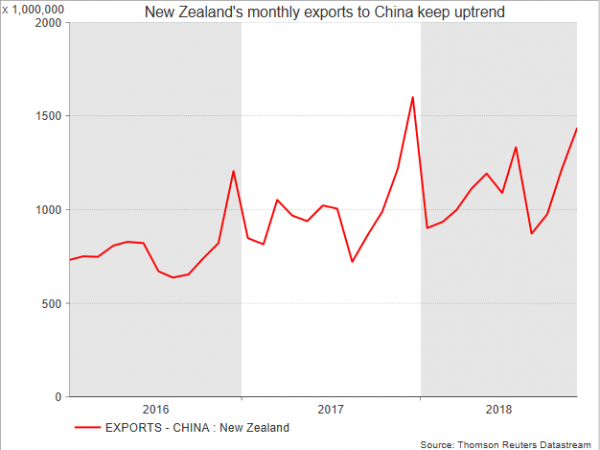 Specifically, the US-Sino trade war is the number one concern at the moment given that China is the top destination for New Zealand exports and hence a big GDP influencer. Even if New Zealand’s overseas sales look unaffected from the already one-year old tariff game, slowing economic activity in China suggests that Beijing may provide less support to its kiwi partner in the near future if it fails to reach a compromise with Washington. Taking all the above uncertainties into account, the odds are increasingly turning in favour of a rate cut and a surprisingly lower-than-expected CPI reading on Tuesday would give another reason for policymakers to think more seriously about a 25bps rate reduction later this year. 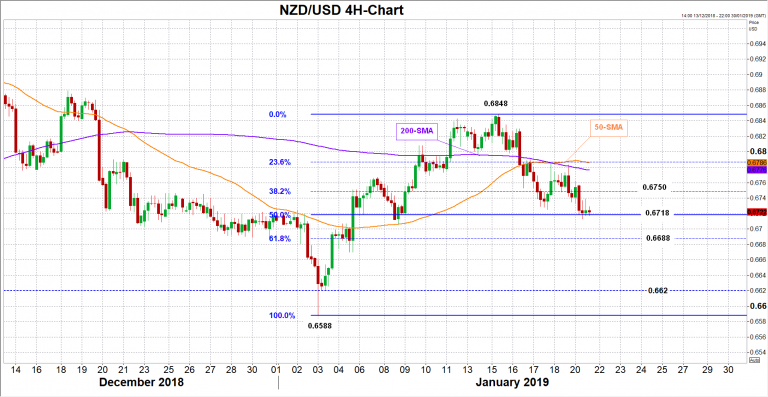 In this case kiwi/dollar could break a key barrier around 0.6718 which is the 50% Fibonacci of the upleg from 0.6588 to 0.6848 and potentially head down to meet support at the 61.8% Fibonacci of 0.6688. 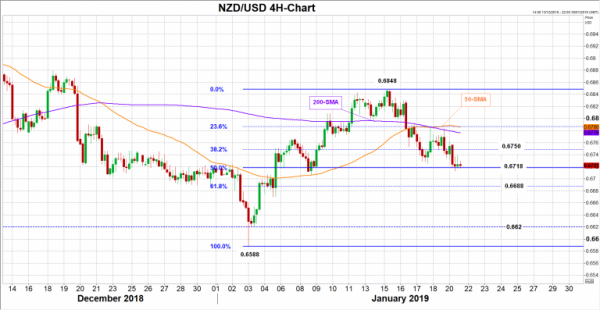 Beneath this level, the 0.6620 mark could halt downside movements ahead of the 0.6588 bottom.